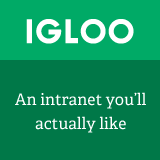 Lee Hopkins, our correspondent from the Adelaide hills in Australia, told us weeks ago about a internal communication plan he had developed for a client that called for intranet improvements, blogs, podcasts and a host of other elements most of us would love to see in our organizations. We had some feedback asking if the plan could be offered to FIR listeners, and Lee graciously agreed. It took a while for him to strip his client’s name and genericize the plan, but he’s done it and forwarded it along. You can get it here. It’s 50 pages long in PDF format, less than 1 MB, and most definitely worth the time it takes to have a look. The 4-minute segment on podcasting starts at about 23:52 into the 45-minute broadcast. We also got a terrific review on a blog called “so this is mass communication” by Dr. Kaye Trammell from Louisiana State University (who, by the way, produced her doctoral dissertation on celebrity blogs). Neville did a great job in an interview with the US edition of PRWeek about “For Immediate Release.” Definitely work a read. The main piece of equipment (other than the Apple Macintosh Powerbook G4) is the mixer. That’s the contraption all the wires are running into. This one is a Behringer (prounced with a hard “g”) Eurorack UB1202. The microphone is a pretty basic Radio Shack mike, the Pro Unidirectional Dynamic. The mike jacks into Line 1, one of four inputs on the mixer designed specifically for a microphone. From the headphone output on the Powerbook, I’m running a cable that plugs into one of the other inputs on the mixer. This allows any sound generated by the computer to be mixed with my own voice coming in from the microphone. This is how Neville’s voice gets into the program. I could also play sounds from any media program, like iTunes or Real Player, from the computer in order to add those sounds to the mix, but instead I’m saving those to the iPod and sending that through the single RCA input on the mixer. 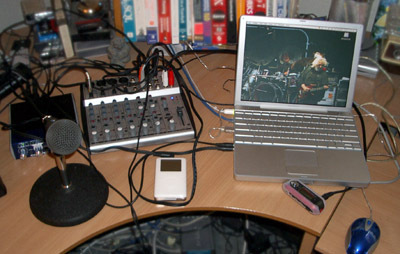 The second pair of RCA cables is a line out; this goes to a separate recorder, an iRiver MP3 player, the iFP-890, with recording capability, where I make a backup just in case something goes wrong with the computer recording. The main output from the mixer goes into the smaller box to the left. This is a PreSonus Comp16 compressor. The compressor takes the various signals from the mixer and adjusts them to a single level (if I understand it correctly). In any case, the sound quality is better with the compressor than without it. The line out from the compressor goes into the line in on the Powerbook. Right now, I’m using Audacity, a free audio recording and editing package, to record the show. I also use Audacity to make adjustments (for example, to amplify the show if the audio is too low) and to convert it to MP3. Then it’s a quick adjustment to the ID3 tags and an upload via FTP to the show server. The only thing you don’t see here are the RCA HP-40 headphones, which jacks into a headphones output on the mixer board. And for those who are interested, my wallpaper on the Powerbook is a concert shot of Jerry Garcia and Mickey Hart. It’s more interesting than a shot of Audacity. There will be a quiz; I hope you were paying attention. That’s quite some hefty kit Shel’s got to do all the tech stuff that makes our bi-weekly show actually happen. So, as also promised, here’s the kit at the Amsterdam end of the podcast. Just to remind you - Shel does all the recording work for the shows; I do the show notes and post those to this blog. Here’s what you’re seeing in the photo, taken today at my home office. On the left is a Toshiba Satellite 5105-S701, customized from the original spec when I first bought it in late 2002 (it now has a gig of RAM, and it’s running Windows XP Pro SP2). This is my primary PC and the one I use for keeping on-screen all the things I’ll need to refer to during a show - blogs, websites, email, you name it. So I tend to have a lot of programs running. I do the show notes for the podcast on this PC. You can’t see it on the screen, but I use BlogJet 1.5.0 to write up the notes. I don’t publish to the podcast blog from this app; I copy the HTML code from the app’s code view and paste it into a new post with the post editor on the podcast blog (which is an Expression Engine blog). What you can (just) see on the screen is Winamp 5.0.8, which I use to listen to the recorded show in order to write up the show notes. I find this app perfect for this purpose: discreet little program which takes up little space on the screen and has easy-to-see time controls so you can quickly jump around the recording, which I often do when doing the notes. This is the time-consuming part, which is when I quite happily sit there listening and pounding the keyboard accompanied by a nice glass of Berberana Carta de Oro Crianza Spanish rioja (not pictured!). I listen to the recording through the Toshiba’s speakers, which have truly outstanding sound quality as they’re built-in Harman/Kardon speakers with sub-woofer underneath the PC. 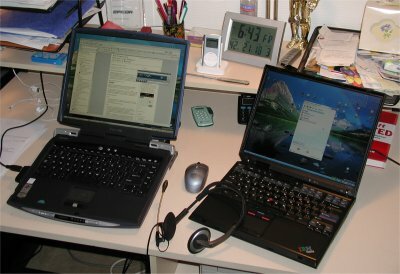 The PC on the right is an IBM Thinkpad T30, again customized (a gig of RAM) and running Windows XP Pro SP2. This is the machine on which I run Skype 1.2.0.21 beta for the call with Shel. I have no other applications running, apart from Norton AntiVirus 2005 and Zone Alarm free version, so there is nothing that can use up any needed computer resources when Skype is running. Resting on the T30’s keyboard for the photo is the headset/mic combo I use - a Plantronics DSP-300. Plugs in via USB, and is an excellent product. Both laptops, incidentally, are wireless and connect with my network via a Belkin F5D7230-4 54g ADSL gateway router. On the shelf between the two PCs is an iPod Mini. It doesn’t have anything to do with the podcast preparation or recording, but I’ll often listen to something (not usually a podcast, actually) while finalizing show notes publishing. The Mini sync’s to the Toshiba through a Sitecom Cardbus 2-port USB 2.0 PC card which you might be able to see on the left side of the Tosh. And that, of course, is important for sync’ing podcasts to the iPod Mini.